Welcome to Math Salamanders Math Worksheets preschool area. In our Preschool area, you will find a wide range of free pre kindergarten Math Activities and other fun math resources for your child will enjoy. Why not take a look at our preschool number worksheets, comparing size sheets, shape tracing worksheets or dot-to-dot pages? By the time children get to preschool, they are starting to develop an understanding of of what a number is and to recognise the number of objects in small groups. Counting is probably the most important skill your child will learn at this age. By the end of pre-k, they should be able to count to 10 reliably, and understand the 1:1 correspondence of numbers and objects, knowing that the last number they counted tells them how many objects they are counting. As well as developing their number sense, they are beginning to understand the language of position, and can tell the relative position of objects using words like 'above', 'below', 'next to'. At this stage, children should be allowed to explore and play as much as possible with different materials, shapes, puzzles, and get an idea of how they work. When comparing objects, children can tell which object is bigger or smaller than another. They can tell when two objects are the same and when they are different. Here are our selection of preschool worksheet webpages where you will find a range of different worksheets which will help you child learn to recognise and write their numbers, match shapes and compare objects. Come and take a look at our dot-to-dot pages, or our free counting worksheets. 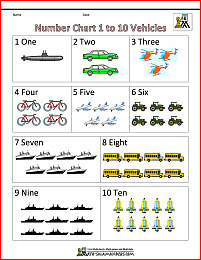 Perhaps you would like to try our preschool size worksheets or number recognition pages. Hopefully you will find something here to meet your child's preschool math requirements! Here you will find our range of free printable pre Kindergarten Counting Worksheets. The following worksheets involve using the basic skill of counting with numbers up to 10. All the free Math Worksheets preschool in this section are informed by the Elementary Math Benchmarks for Kindergarten. These sheets will help your child learn to write and form the numbers from 1 to 10 correctly. These sheets will help your child learn to count on and back in ones, and put numbers up to 10 in the correct place in their sequence. The worksheets here will support your child in counting one more/one less than a number of quantity. Most of the sheets focus on counting up to 10. There are also some worksheets that go up to 25. In this section, take a look at our matching worksheets to help develop your child's matching and visual skills. There is also our comparing sheets which will help language and understanding of words like 'biggest' or 'smallest'. Some of the worksheets are number-based, but most just use different objects and animals to compare. compare numbers up to 10. The sheets in this section involve matching objects or numbers of objects to numerals. Here you will find a range of free Shape Clipart for preschool. These resources will help your child to learn their 2D shapes, and also learn some of the properties they have. There are some color sheets for display, or outline sheets to color in. All the free Math sheets in this section are informed by the Elementary Math Benchmarks. Here you will find a range of free printable preschool Math activities. The activities include dot-to-dot and coloring pages. The activities have been designed to keep your child motivated and engaged whilst learning their Math facts at the same time.